I have been meaning to start a blog for some time now. I mainly want a place to archive my experiences doing the things I love to do — soap making, gardening, cooking and golf. Since my golf game is going down hill because I am spending so much time doing the other things we probably will not spend much time on that subject. I just got back from the Soap Guild conference in Raleigh. Three days of soap, soap and more soap. It was so much fun being around like minded people not to mention the great speakers and demonstrations. And the vendors had so many tempting things. I did buy a new soapy toy – a shrink wrap system. I can’t wait until it gets here. 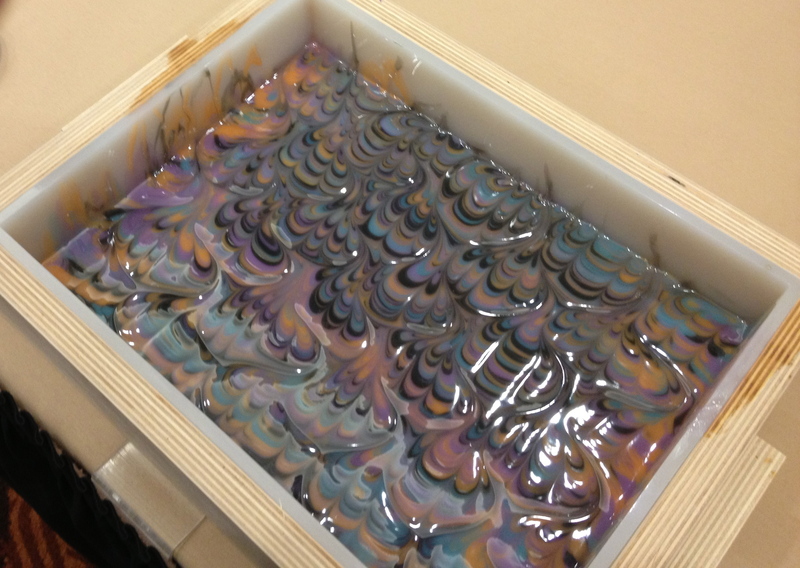 This is a picture of the peacock swirl soap Amanda Griffin (of Lovinsoap.com) demonstrated at the conference. I came home with this at the top of my to do list. And, this morning I got an email from Amy Warden of Great Cakes Soapworks announcing some details of a new Soap Challenge Club. The first challenge is going to be the peacock swirl! Amy said the preferred way to enter your soap is on a blog. That was motivation to finally get this set up. I am looking forward to the challenge and sharing my creation with you.